Payday and a bank holiday are just around the corner, so if you're in the #feelingspendy mood, here are four new product launches to tempt you! If you're into truly luxury pampering at home, Aveda's new Beautifying Radiance Polish will be a surefire winner to invest in. This is their latest addition to the popular Beautifying range, so it shares the same gorgeous scent as the rest of those products which is thoroughly uplifting and spa-like, with pure essential oils of Organic Rosemary, Lavender and Bergamot - basically heaven in a tub. The scrub is composed of a rich oil blend (Organic Safflower and Olive oils) with natural mineral-rich salt crystals, so you get the best of both worlds as it's exfoliating and it leaves your skin feeling soft and moisturised afterwards. Lovely stuff! Now, I'm always sceptical about products which claim to 'tone' or 'firm' your skin, especially ones that target your wobbly bits, but I was pleasantly surprised by He-Shi's new Body Sculpting Gradual Tan which launched last month. Here we have a traditional gradual tanner lotion re-imagined with an innovative 'active slimming ingredient' called Intenslim. It also features Caffeine, Irish Moss, Globe Daisy extract, Bitter Ginger, Glycerine, Vitamin E and 3% DHA which is 100% natural and Eco-Cert approved, and is paraben and alcohol-free. Ignoring the 'slimming claims', I noticed that this gradual tanner gives you a natural looking, light tan colour that builds up after 1-2 days, but that it also does make your skin appear more toned, and it feels much more firm. It's not going to make you look like you've been hitting the gym for 8 hours a day, but the firming/toning effect did make me feel a lot more confident about baring my legs for the first time since last Summer. That's pretty impressive, no? 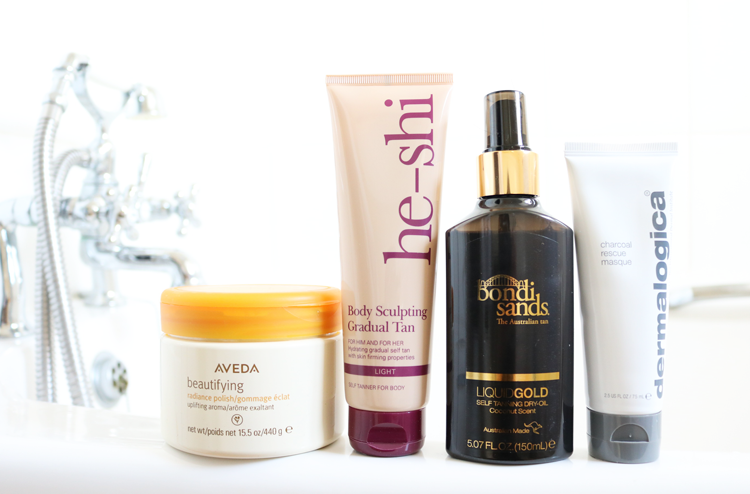 I've tried out a lot of self-tanners over the years in all sorts of formulations - mousses, sprays, lotions, mists, foams - you name it, I've probably tried it at least once! However, I had never tried a self-tanning dry oil until now, and it's all thanks to Bondi Sands' Liquid Gold. This self-tanning dry oil is infused with Argan and Coconut Oil, and features the classic coconut fragrance that BS have become famous for. It's not something that I would recommend to self-tanning newbies though as it's a bit tricky and daunting to apply. Firstly, there's no guide colour so you're not 100% sure that everywhere is covered and secondly, you have to spray it directly onto skin and buff it in with a tanning mitt afterwards, otherwise your mitt will just absorb all of the oil. That said, with some practice, it's got some definite plus points in that it dries quickly, there's absolutely no transfer/rub off onto clothes or bedsheets, you don't need to shower it off, and after 8+ hours it develops into a beautiful, natural looking warm tan colour. Having oily/combination skin means that I have acquired an arsenal of detoxing face masks in my skincare stash, and my newest one is from Dermalogica. Their Charcoal Rescue Masque uses a powerhouse of natural actives such as Kaolin clay, Binchotan Charcoal Powder, Volcanic Ash (yes really - Volcanic Ash! ), Sulfur, Sea Silt, Bamboo extract and Alpha Hydroxy Acids, to draw out impurities, exfoliate and brighten dull skin. It comes out of the tube as a thick grey paste which looks a little scary on so it's maybe one to try when your housemates are walking the dog or something. When it's on your face, it sort of tingles (nothing painful, just that usual 'it's working feeling') and it makes everything feel very, very tight. This is not a mask to use if you sensitive skin or if you have a habit of leaving them on longer than the instructions say so but boy, can you see a difference afterwards. My skin looked visibly brighter and clearer, with a lot of the 'gunk' being washed off with the mask. Sounds gross but at least it works! Be sure to follow it up with a hydrating face mask or serum afterwards though as it does feel quite drying. 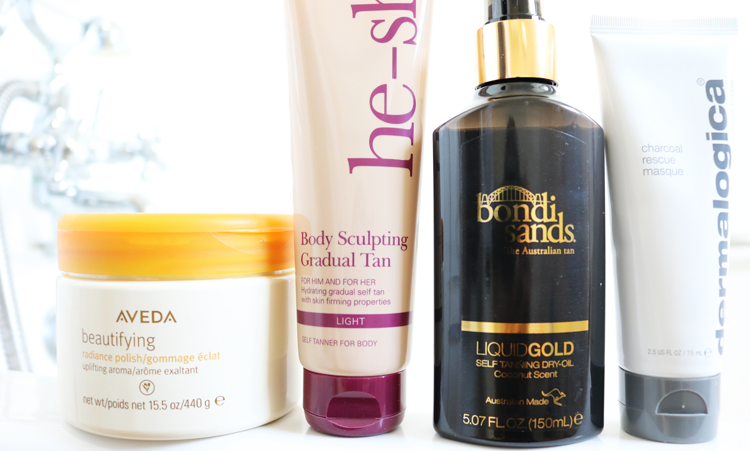 I've really been enjoying the Bondi Sands spray! Smells lovely too!